This active, fully guided, private two day trip offers you an easy cycling journey along Nelson’s newest attraction – The Great Taste Trail, staying a night in a luxury B & B accommodation in the Kina peninsula/Mapua area, then into the Abel Tasman National Park on the second day to walk in the park, staying the night at Peppers Awaroa Lodge. 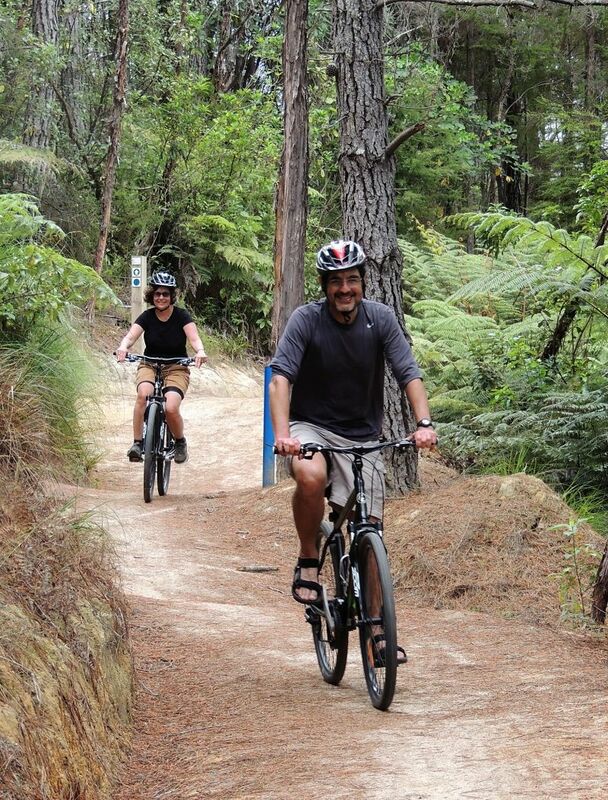 Simply Wild have been offering guided mountain biking and cycling trips in Nelson since 2006. We’re delighted to have the opportunity to offer easy cycling on The Great Taste Trail. Nelson’s Great Taste Trail is part of the National Cycle Trail Network, offering easy, family friendly touring through a wide variety of landscapes. Easy-to-ride, with a gradient similar to the Otago Central Rail Trail, the Great Taste Trail caters for a wide range of cyclists and walkers. 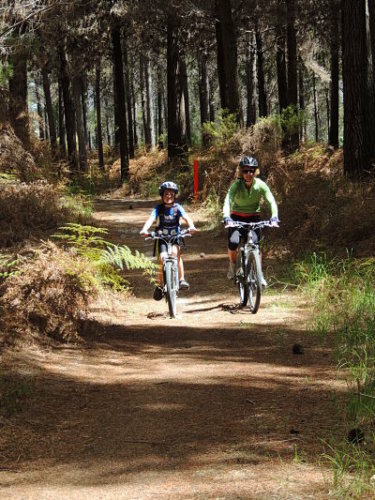 As stages of the trail are completed there will be the choice of day rides or a series of overnight stops. When complete, the whole trail – including a section in the Motueka River Valley – will eventually cover a distance of about 175km and will run from Nelson Airport, to Richmond, out to Tapawera, along the Motueka River Valley to Riwaka, and then back to Richmond through Motueka and Mapua. 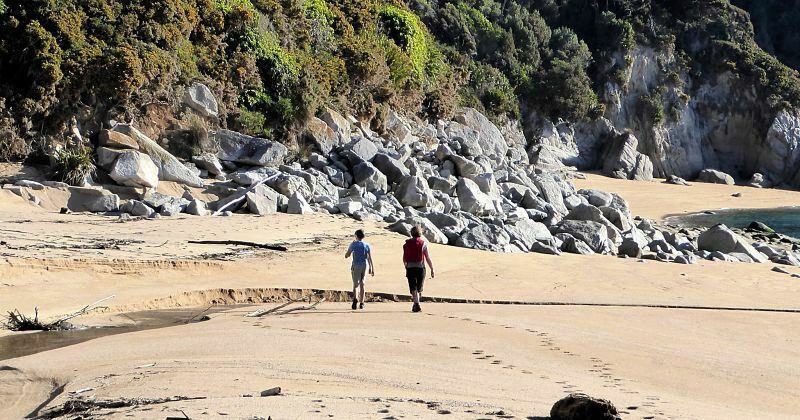 The Abel Tasman National Park is the smallest jewel in the crown of New Zealand’s national park network (22,500 hectares) yet it reflects a unique identity among the much larger, more mountainous parks. 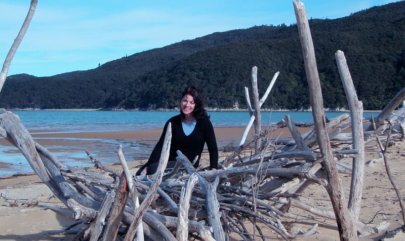 It encompasses kilometres of idyllic golden sand beaches washed by the tidal flows of Tasman Bay, linked by an easy walking track of exceptional standard, alternating with hidden coves, estuaries and spectacular granite outcrops. Offshore lie numerous islands punctuating the broad sweep of Tasman Bay, providing sanctuary for seabirds, seals and penguins. Looking down toward the sea from the track while walking, you will see the brilliant blue-green of the water and golden sand set against luxuriant forest and tree fern, with a feeling of being on an island paradise. Looking inland however, the park presents a different profile, with dense forested hills rising steeply to 800 – 1100 metres, drained by rugged watersheds which fall to the coast through deep gorges and impassable waterfalls. The park has an interesting history, with Maori settlement, Dutch and French explorers, before being settled by English settlers in the 1850’s. 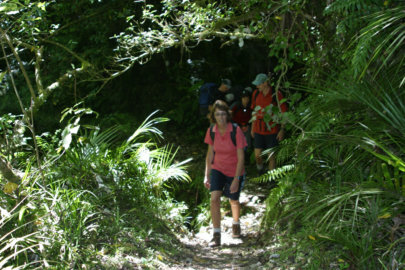 The first section of the trail begins at Norris Gully near the village of Wakefield, set in the foothills of the Waimea Plains, and initially travels through disused old rail tunnel (1.4 kilometres long) and a classic heritage landscape dotted with vineyards, apple orchards, market gardens and the village of Brightwater, before reaching the Tasman Bay coastline near Richmond. 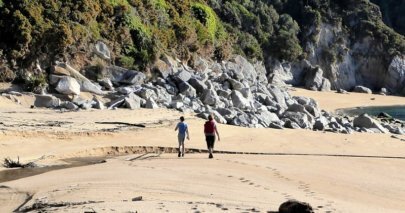 It then follows the coastline around the Waimea Estuary to Rabbit Island, a council reserve with recreation areas and pine forest, where you can stop for a swim on the expansive beach. The trail travels along the island to the old Mapua wharf, a small boutique area of interesting shops, cafes and a brewery. The final leg across to the wharf and Mapua village from the island is across the estuary by special bike ferry. The section between Norris gully and Mapua takes around 3 1/2 – 4 1/2 hours at an easy pace. 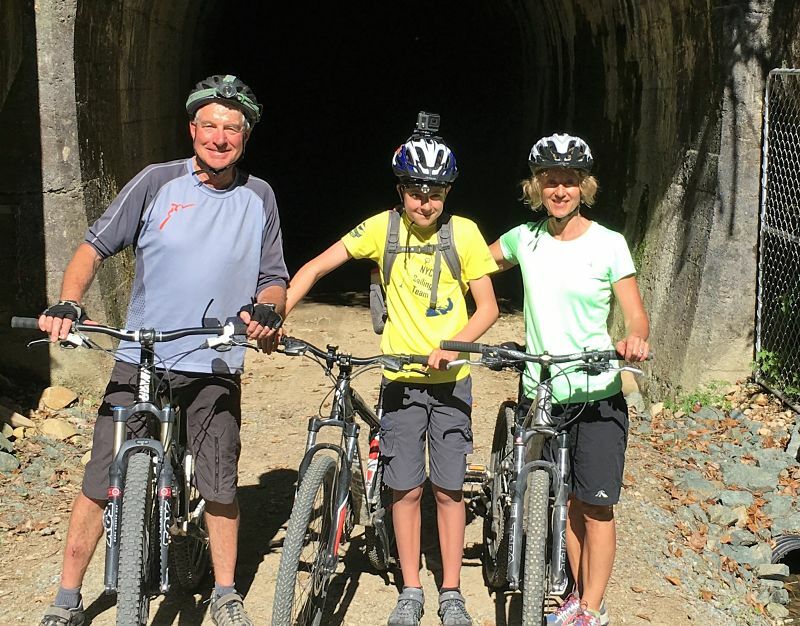 The trail has some special tasting experiences, including wineries, craft breweries, little cafes, fresh seafood, fruit and pick-your-own berries during the summer months. 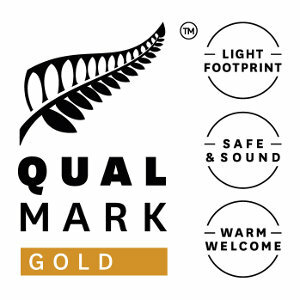 Your accommodation for the night will be either in the Mapua area, or in Nelson City if you prefer. 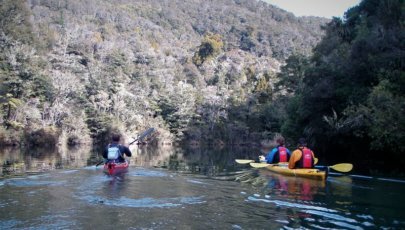 Next morning your guide will collect you for the 20 minute drive to Marahau on the coast near the Abel Tasman National Park, where you will board a water taxi to gain access to the park. 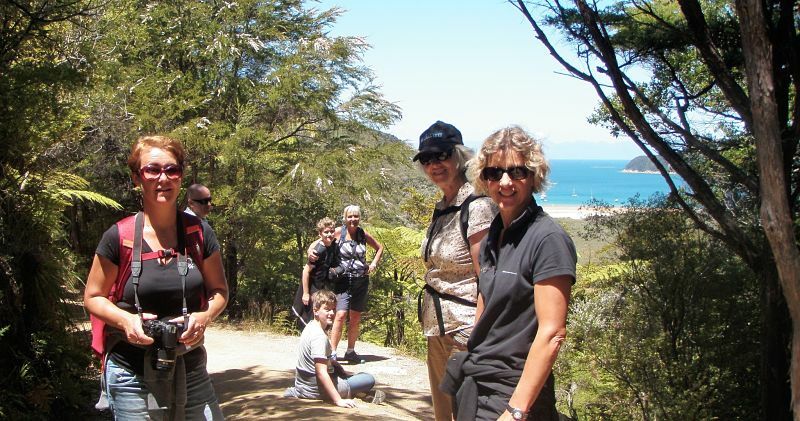 We will have discussed your walking preferences with you the day before and picked a section of the Abel Tasman track to walk that suits your fitness and interests. 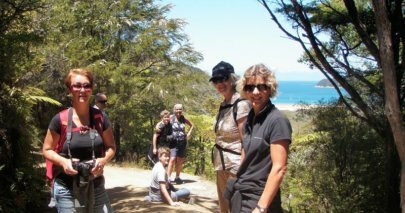 You’ll hike along the coast through native bush, past lovely estuaries and along golden sand beaches. If you would like a longer walk, (5 – 6 hours and 20 kilometres), we’ll walk from Anchorage or Torrent Bay all the way to Awaroa. 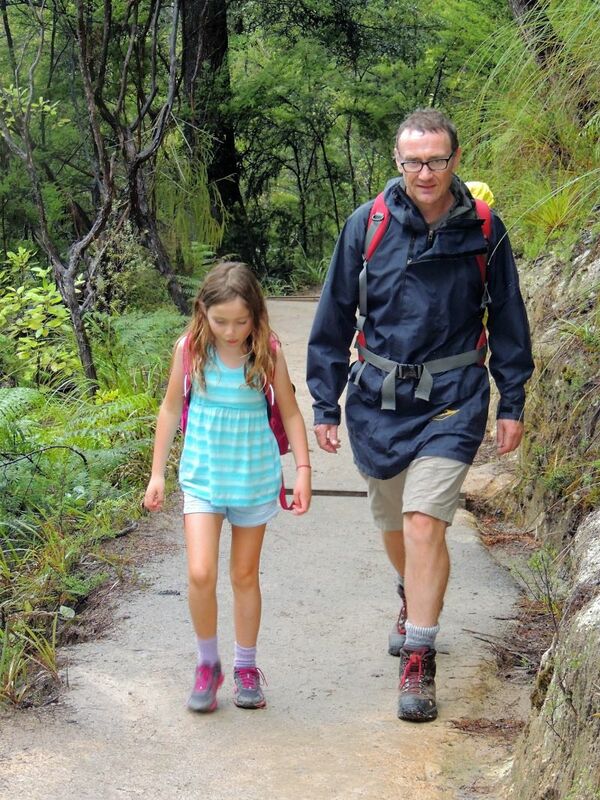 If you prefer a shorter walk we’ll walk from Bark Bay to Awaroa, (3 hours and 11 kilometres). From Anchorage and Torrent Bay the track ascends a saddle and cuts inland, with great views along the coastline before crossing the swingbridge at Falls River and descending to picturesque Bark Bay. Its a short climb out of Bark Bay and head inland again on our way to Tonga Bay and the golden crescent of Onetahuti beach, before climbing the low saddle over to Awaroa. We provide a delightful picnic lunch along the way on one of the many golden sand beaches. 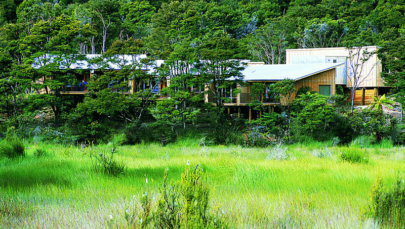 Arriving at Peppers Awaroa Lodge, you are free to relax, shower or wander down to the wonderful beach. This unique lodge set in the middle of the park, accessible only by boat, helicopter or walking, is worth experiencing on its own. 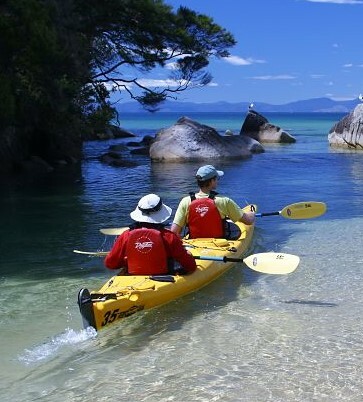 Depending on weather conditions you’ll sea kayak from Awaroa, or water taxi around to beginning at Onetahuti exploring the famous Abel Tasman coastline, one of the best sea kayak destinations in the world. 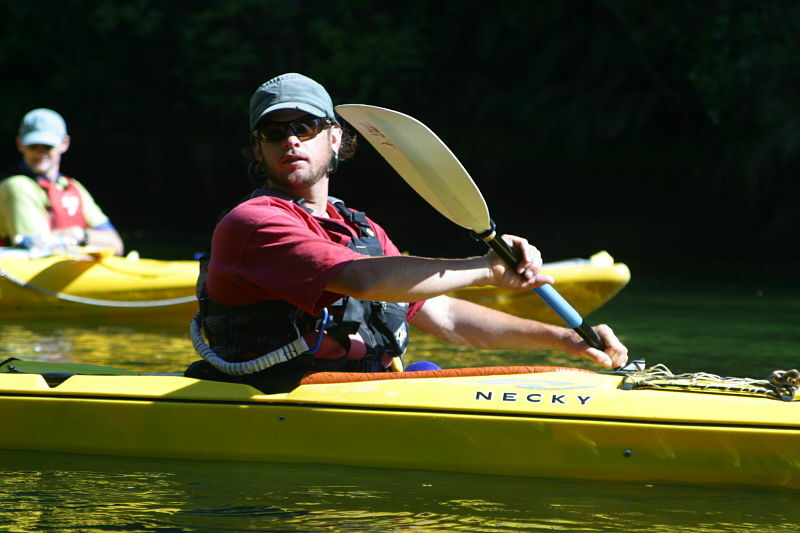 You’ll enjoy paddling along the rocky coastline, with it’s golden beaches, tranquil inlets and native bush, before completing the paddle at Bark Bay or Anchorage depending on your preference. From either destination we’ll take by water taxi and vehicle back to Nelson. You have a relaxed morning before catching the first water taxi back to Marahau with your guide. 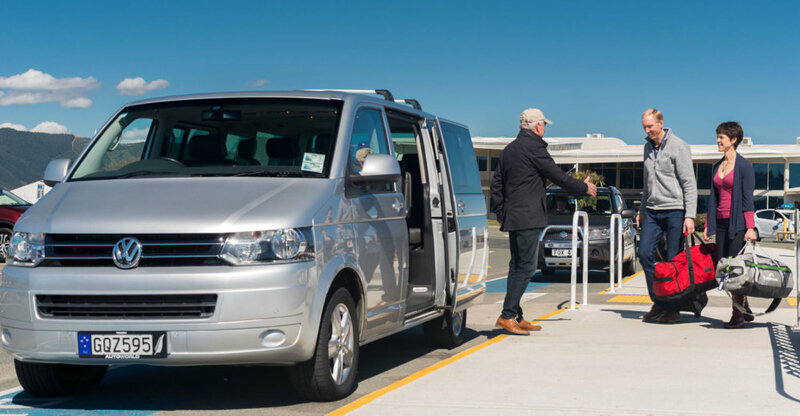 We will transfer you to the airport or Nelson accommodation if you intend staying another night. 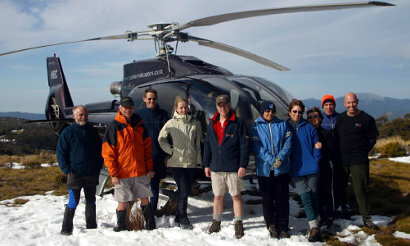 An option is returning to Nelson by fixed wing plane or helicopter from Awaroa.